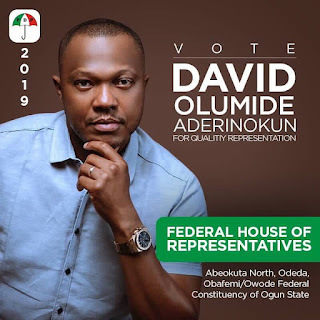 TV Star Stephanie Coker's Husband Olumide Aderinokun joins politics,set to contest for House of Rep.. The TV star's husband has been the subject of controversy a couple of times,but he is not letting that get in the way of him serving.. He has now picked up the ticket on the platform of the PDP to contest for the Federal house of representatives. To God we owe all the glory 🙌🏾 Thank you to everyone, my wife, family & friends for the support. I am pleased to announce that I am PDP’s elected candidate for the post of House of Representatives, Abeokuta north, Obafemi-Owode and Odeda federal constituency. Okuta ti omole ko si ile ni o wa paada di igun ile. Ogun state let’s go! Vote DOA! He shared..